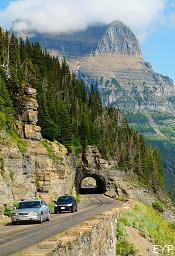 Going To The Sun Road in Glacier National Park. 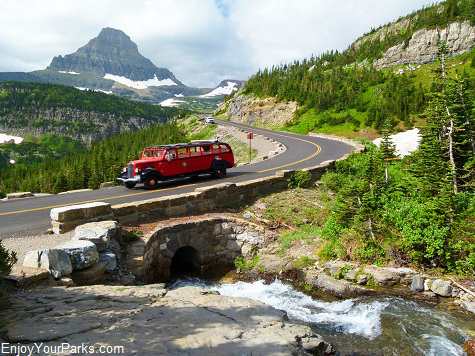 Red Buses are an iconic sight along the Going-to-the-Sun Road. 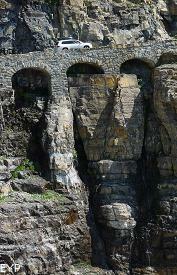 is one of the world's civil engineering marvels. 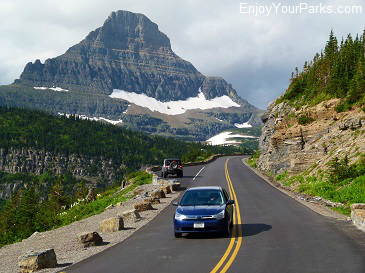 This is the only road that cuts through Glacier National Park, and is regarded by many as one of the most scenic drives found anywhere in the world. 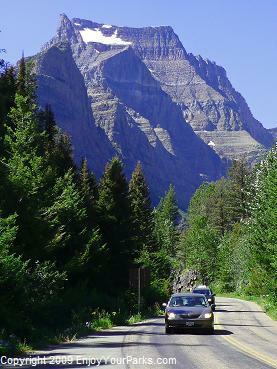 The road was named after Going-to-the-Sun Mountain, which is located directly east of Logan Pass on the Going-to-the-Sun Road. 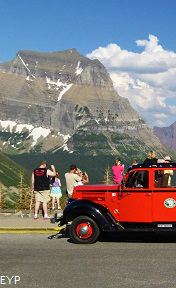 Completed in 1932, this 52 mile road begins at the town of St. Mary, then climbs up the east slope of the mountains of Glacier National Park, and crests at the continental divide on Logan Pass. 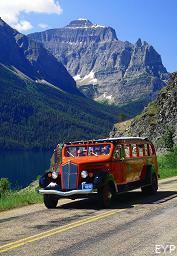 The Going-to-the-Sun Road then works its way down the west slope of the divide, eventually reaching Lake McDonald Lodge, Apgar Village, and then on to the town of West Glacier. 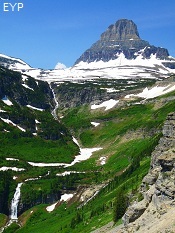 This is a popular view from the west side of the Going To The Sun Road. 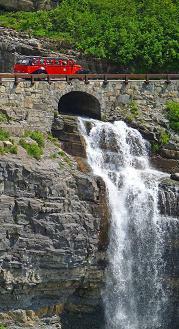 The Going To The Sun Road one of the few structures in the United States that is BOTH a National Historic Landmark AND a National Historic Civil Engineering Landmark. 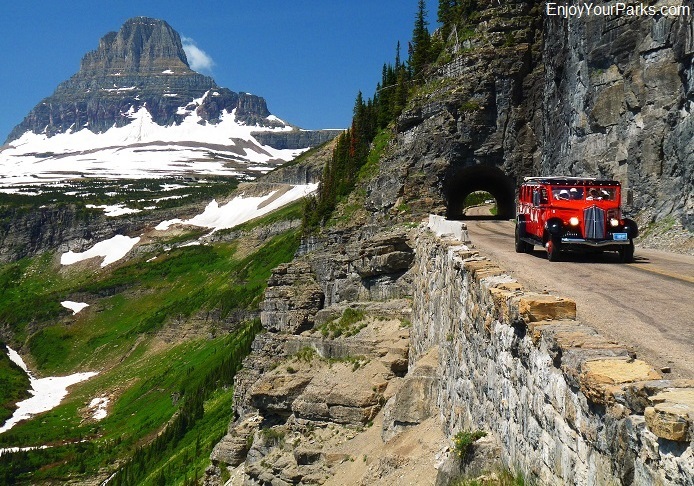 This world famous highway is a national treasure, and is an absolute "Must Do" while vacationing in Glacier National Park. 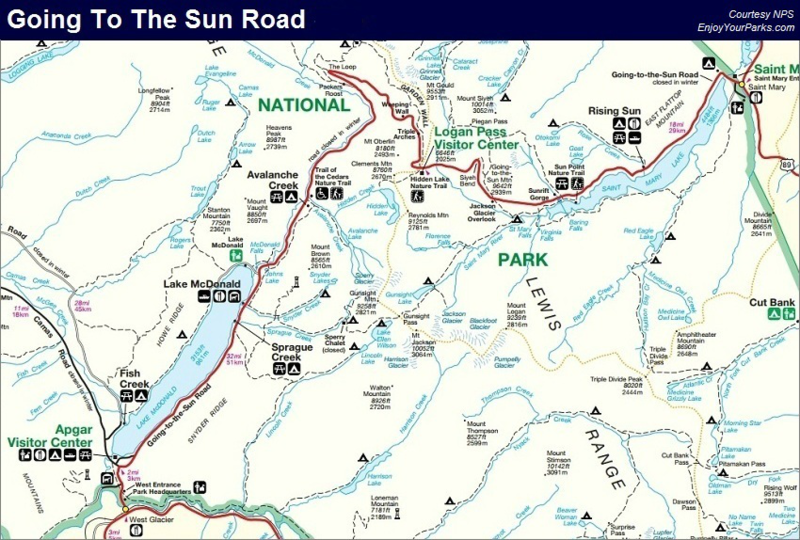 To see a map of the Going To The Sun Road, please see the bottom of this page. 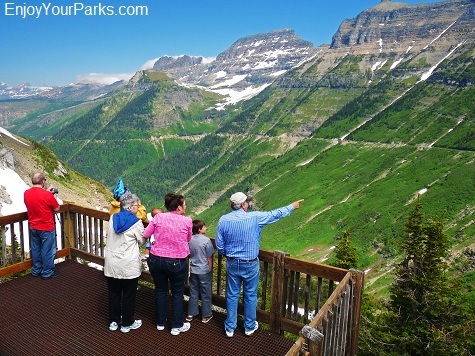 The views from the Going To The Sun Road are breathtaking! 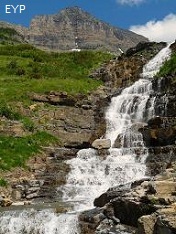 When Does The Sun Road Open? 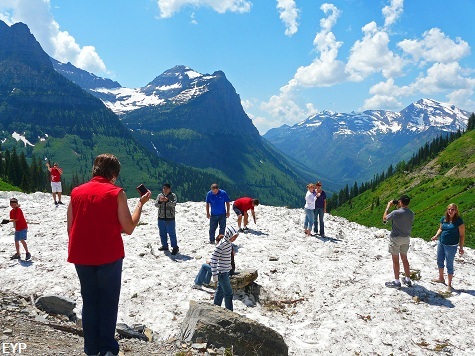 Glacier Park gets a ton of snow each year, and each year it's a major project to remove all this snow from the Going To The Sun Road to open the summer season. 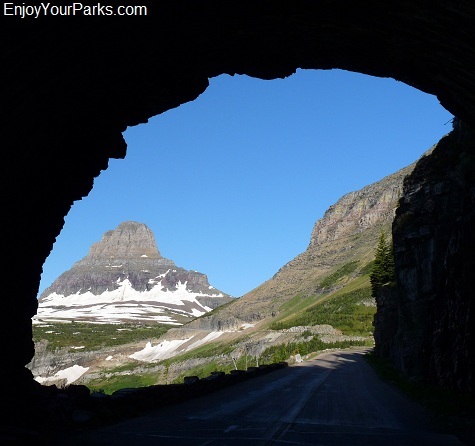 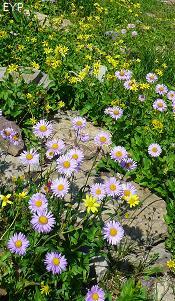 The Going To The Sun Road usually opens by early to mid June, HOWEVER, the actual date varies each year. 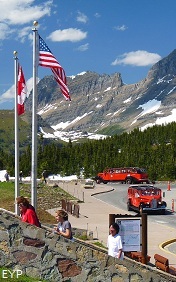 In 2011 the road was not open until July 13th due to heavy late season snow fall. 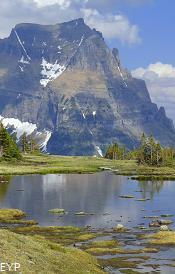 Wild Goose Island along the Going To The Sun Road in Glacier Park. 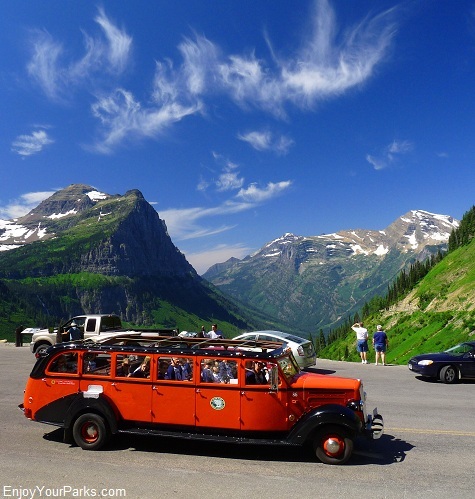 For details on all the major Pullouts and Exhibits along the Going To The Sun Road in Glacier National Park, click here. 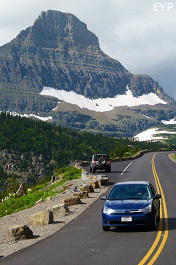 For a current road report, click here. 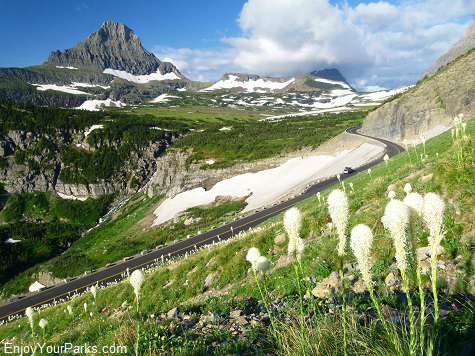 Logan Pass is the highest point along the Going To The Sun Road in Glacier National Park. 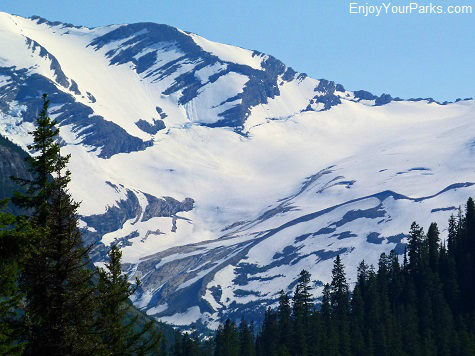 Early in the season, there will definitely be snow! 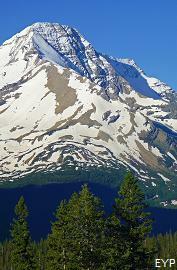 This photo was taken July 13th, 2011 on opening day. 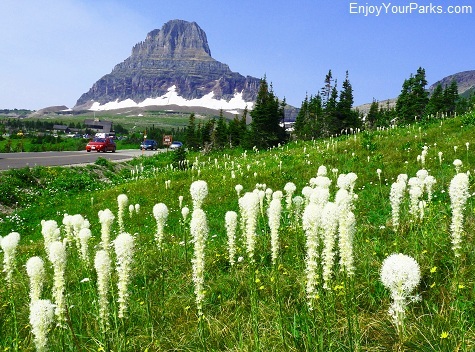 Logan Pass is the highest point along the Going To The Sun Road (6,646 feet) and is undoubtedly one of the most popular places to explore in the Glacier Park. 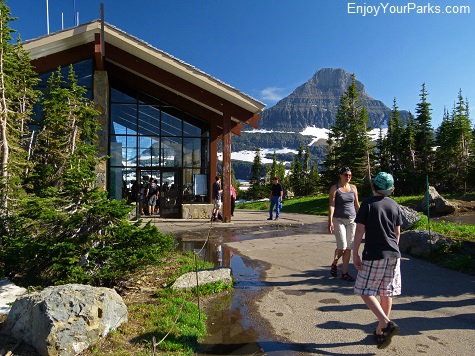 Not only are the views tremendous in all directions, but there is also a Visitor Center, as well as trailheads to two of the most popular hikes in Glacier National Park- the Hidden Lake Overlook and the Highline Trail. 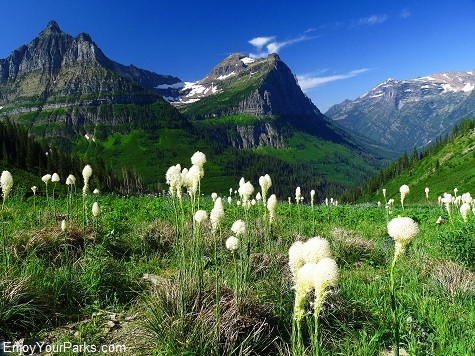 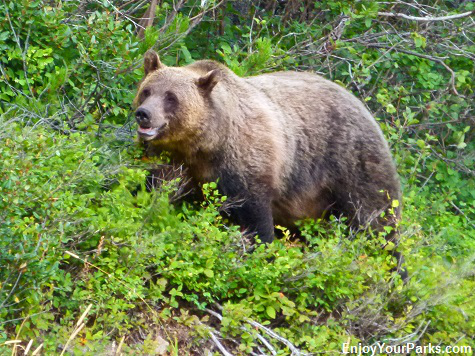 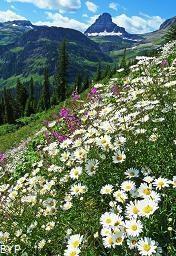 If you like hiking, these two trails are "must do's" while vacationing in Glacier Park. 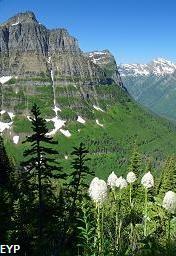 Logan Pass on the Going To The Sun Road, Glacier National Park. 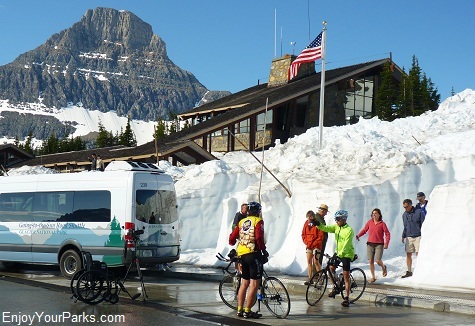 July 13th, 2011 opening day on Logan Pass along the Going To The Sun Road in Glacier National Park. 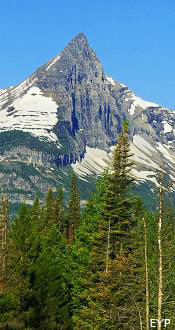 Clements Mountain towers over the Logan Pass Visitor Center. 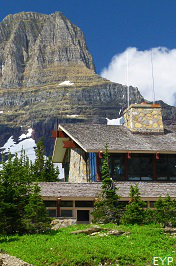 The Logan Pass Visitor Center is a great place to learn all about the Logan Pass Area. 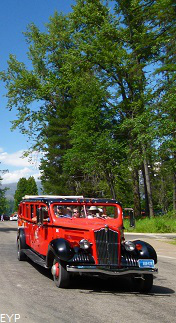 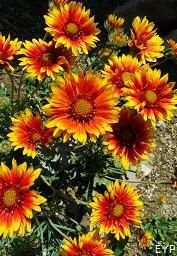 For details on all the major Sun Road Pullouts and Exhibits, click here. 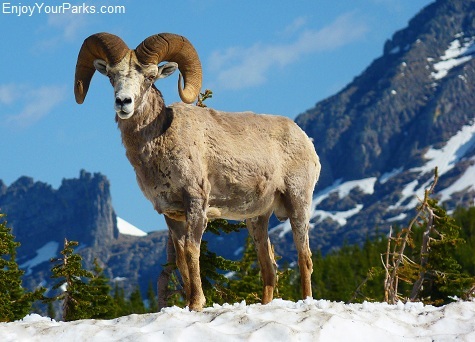 wildlife, forests, and breathtaking heights. 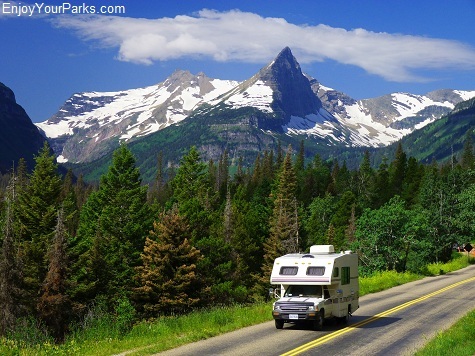 You'll never forget your journey across the middle of Glacier National Park, and your life will be forever changed in an incredibly positive way. 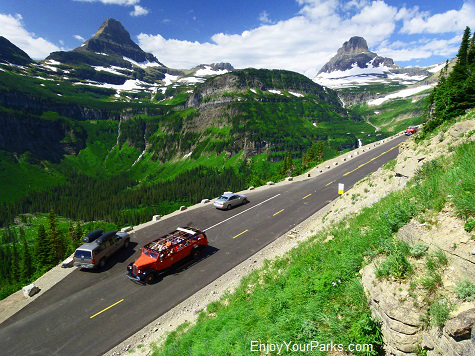 The beauty that you will behold on Going-to-the-Sun Road is absolutely magnificent, and there is no other place like it on earth. 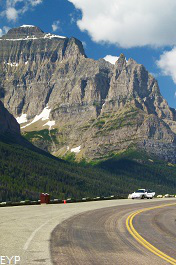 There are towering mountains everywhere you look as you drive along the Going To The Sun Road in Glacier National Park. 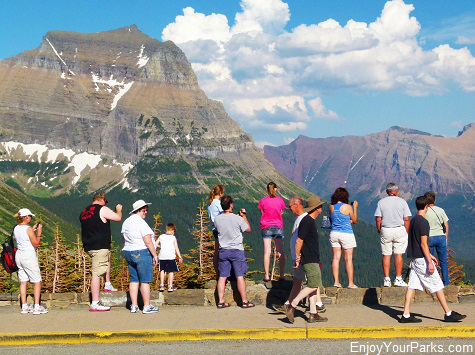 There are plenty of turnouts along the Going To The Sun Road to enjoy the spectular view, such as the Oberlin Bend Overlook. 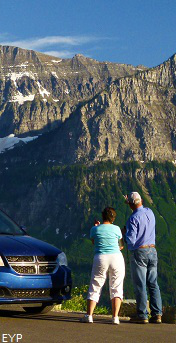 For more turnouts along the Sun Road, click here. 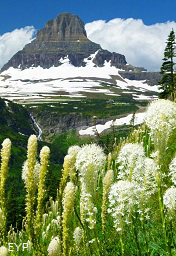 This is a classic view of Little Chief Mountain as you climb upward towards Logan Pass on the Going To The Sun Road. 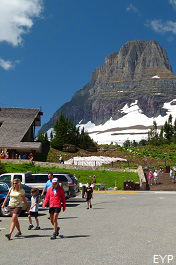 There is no food available at Logan Pass on the Going-to-the-Sun Road. 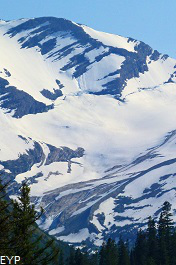 There is however a drinking fountain, but it's a good idea to bring your own beverages as well in case the fountain is out of order. 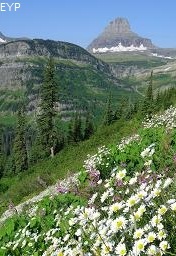 GET TO LOGAN PASS BY 10 AM! 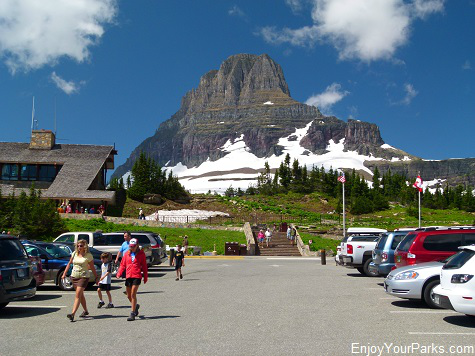 This is one of the most popular places in Glacier National Park, and the parking lot usually fills up by 11 AM. 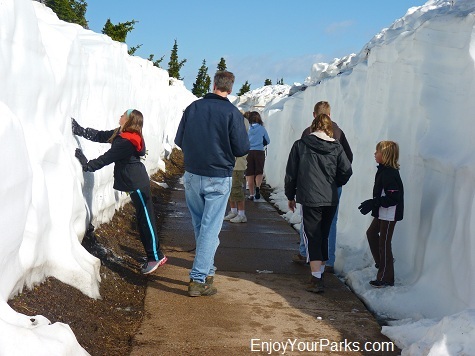 There is limited parking, so to avoid a frustrating struggle to find a parking spot, get there early! 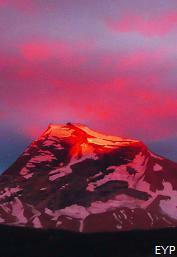 Plus, by getting there early, the morning sun really makes the landscape glow, so it's a great time for photos. 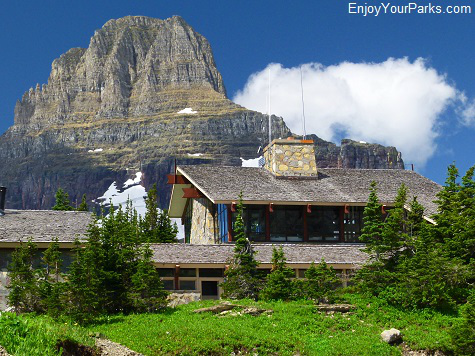 If the parking lot has a sign that says "full" this is only temporary. 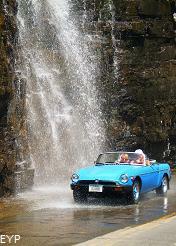 We strongly recommend that you drive to the next major pullout, whether it be Lunch Creek on the East Side, or Oberlin Bend on the West Side, and enjoy these areas. 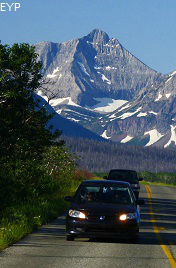 Then, after a half hour or so, drive back up to Logan Pass and try again. 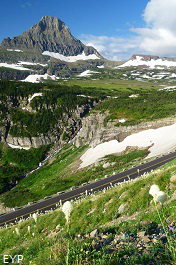 Logan Pass parking lot along the Going To The Sun Road in Glacier National Park. 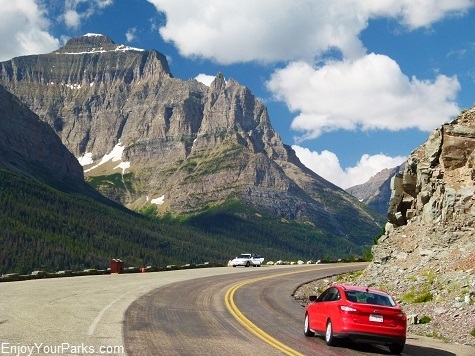 DRIVE THE ENTIRE ROAD, BOTH WAYS! 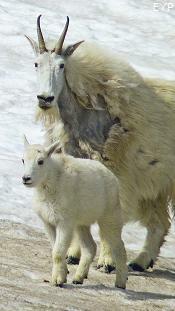 This is really important information. 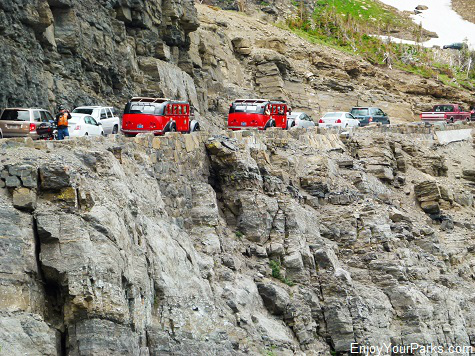 There are basically four segments to the Going-to-the-Sun Road. 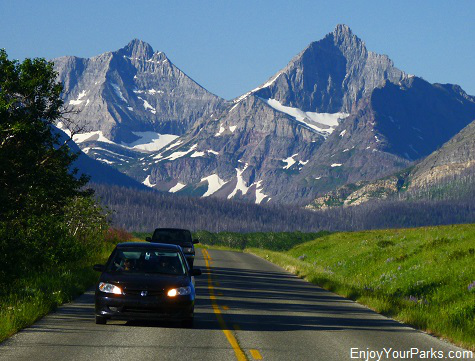 The first segment is from St. Mary up to Logan Pass, which is the east side of the continental divide. 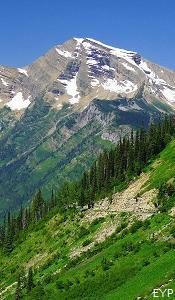 The second segment is from Logan Pass down to Lake McDonald Lodge on the west side of the divide. 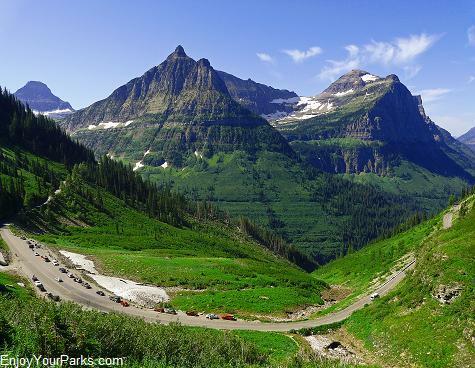 The third segment is from Lake McDonald Lodge back up to Logan Pass, and the fourth segment is from Logan Pass back down to St. Mary, which is the East Entrance of Glacier National Park. 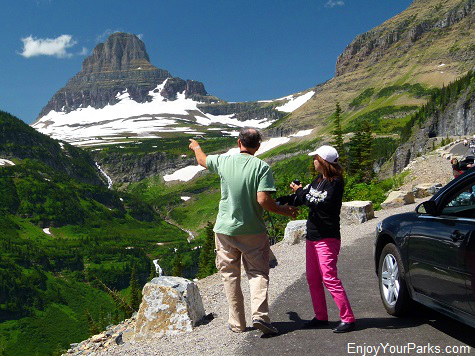 The reason we strongly recommend that you drive the Going-to-the-Sun Road both ways is the fact that the views are COMPLETELY DIFFERENT each direction you drive. 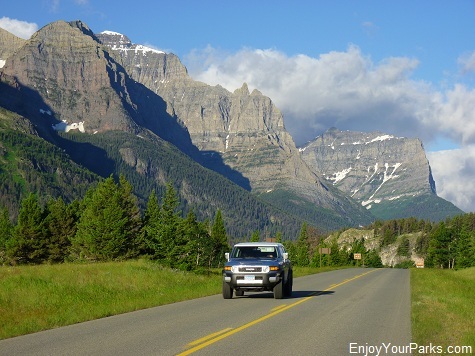 It's just as if you were driving a completely different road, and each view is unbelievably gorgeous, and well worth the effort. 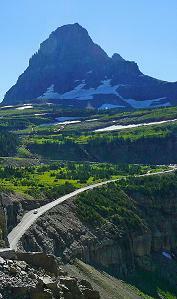 This is a classic view of Reynolds Mountain as the Sun Road works its way up to Logan Pass from the east. 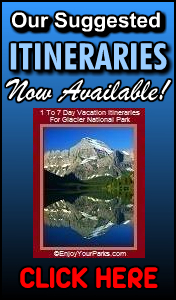 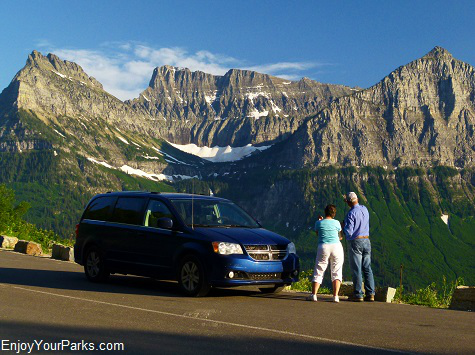 For the best way to cover all four sections of the Going-to-the-Sun Road in the most efficient way, check out our helpful E-book discussing our Suggested Glacier Park Travel Itineraries. 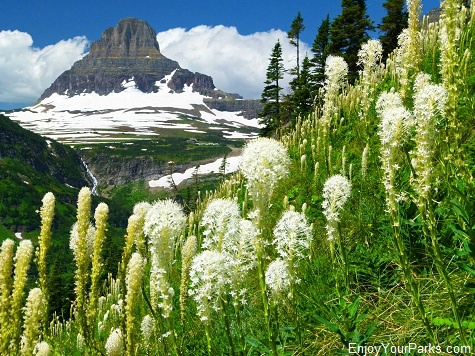 BE PREPARED TO GO HIKING! 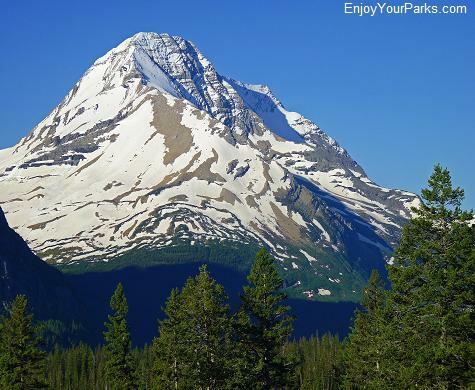 Once you reach Logan Pass, we can guarantee you that you are going to want to go on a short hike, either to the Hidden Lake Overlook or a few miles up the Highline Trail. 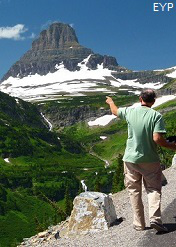 BOTH of these trails are among our Top Ten Things To Do In Glacier National Park. 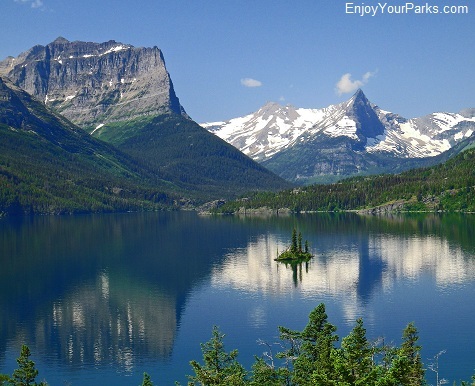 As we have said time and time again, Glacier Park inspires people. 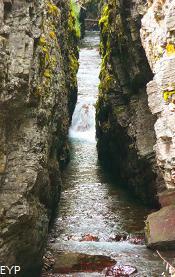 You too will be inspired, and you will want to walk into this remarkable beauty. 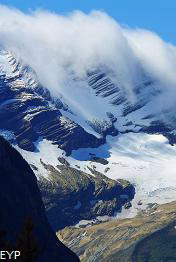 So bring the proper clothing and proper footwear. 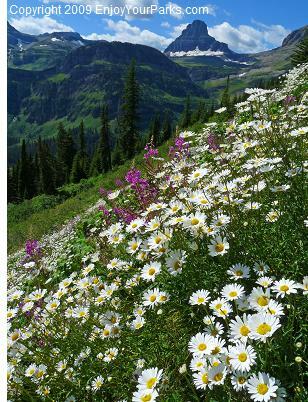 We have seen many a visitor end up wearing flip-flops on the Hidden Lake Trail because they weren't expecting to go hiking. 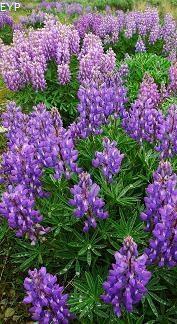 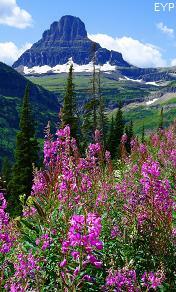 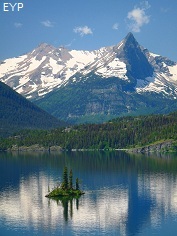 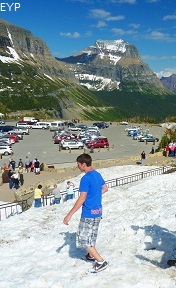 But once again Glacier will do it's magic, and off to the Hidden Lake Overlook they go, flip flops and all! 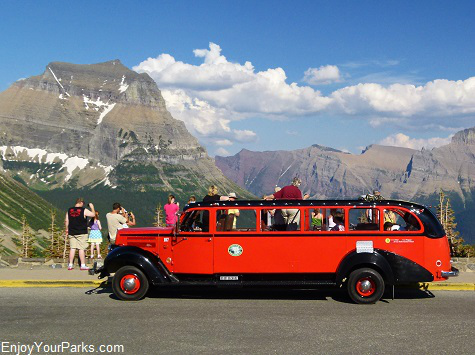 The Red Buses that you'll see all along the Going To The Sun Road in Glacier National Park are an iconic symbol of Glacier. 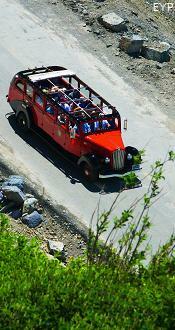 These buses are part of the original 1930 fleet, and are known as "Jammers". 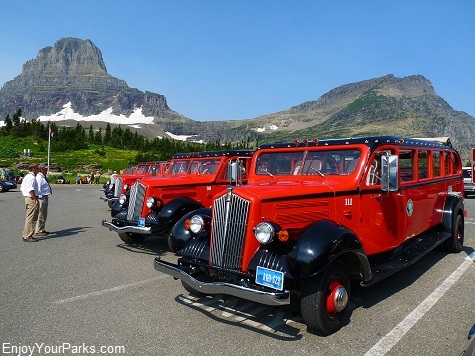 This famous fleet was restored in 2001, and are a welcome sight along the Going To The Sun Road. 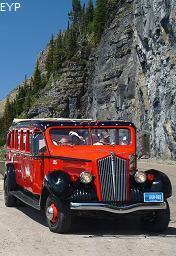 Red Bus parked at the Logan Pass parking lot in Glacier National Park. 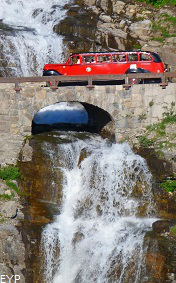 Red Bus coming down the east side of the Going To The Sun Road in Glacier National Park. 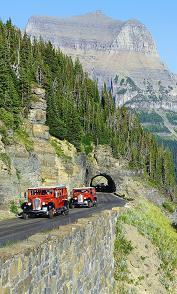 Going To The Sun Road in Glacier Park near Rising Sun. 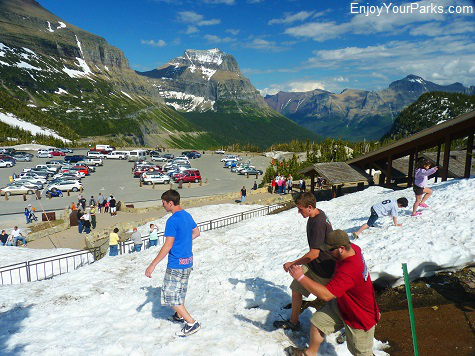 Visitors playing on a snowfield in August on the Going To The Sun Road. 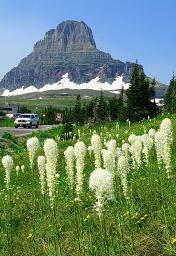 Beargrass on Logan Pass along the Going To The Sun Road in Glacier National Park. 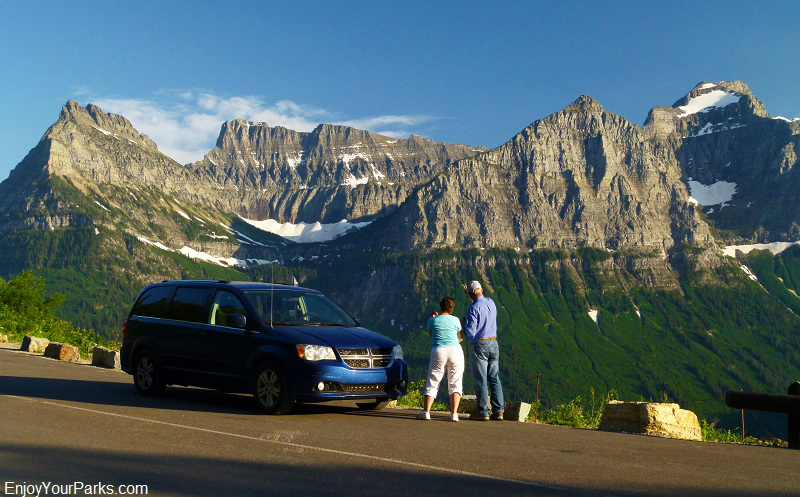 Visitors taking in the view from the parking lot on Logan Pass in Glacier National Park. 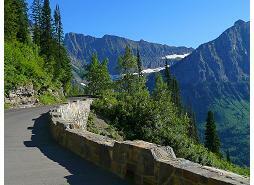 This section of the Going-to-the-Sun Road is known as "The Big Bend". 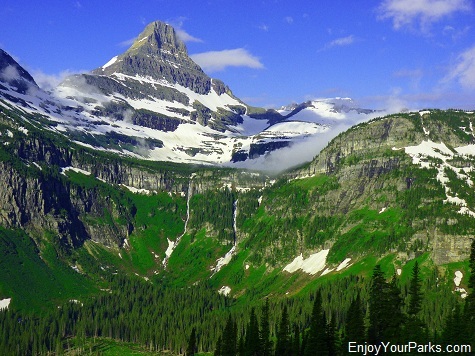 This is the view of Mount Jackson from the Jackson Glacier Overlook on the Going-to-the-Sun Road in Glacier National Park. 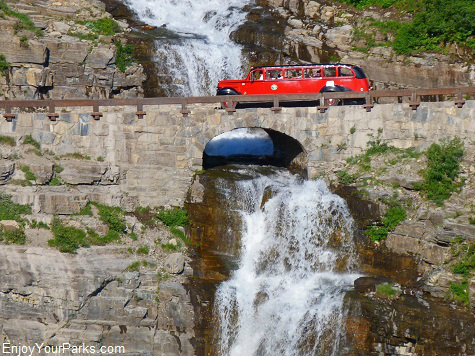 The Going To The Sun Road definitely has its share of abrupt drop offs! 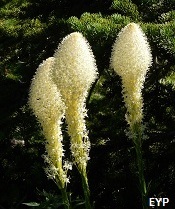 Beargrass near Logan Pass on the Going To The Sun Road in Glacier National Park. Tunnel along the Going To The Sun Road near Logan Pass in Glacier National Park. 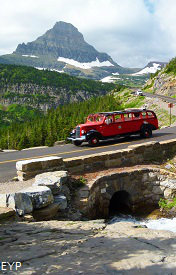 Red Bus driving along the west side of the Going To The Sun Road in Glacier National Park. 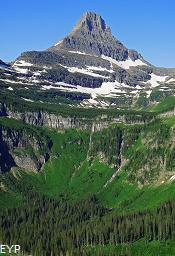 A view of Mount Oberlin and Cannon Mountain from the Big Bend along the Going To The Sun Road in Glacier National Park. 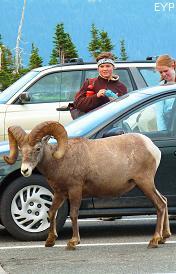 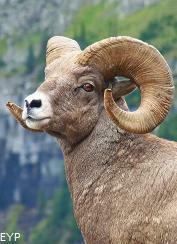 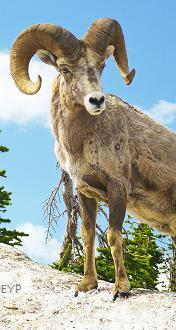 Bighorn Sheep love to hang out on Logan Pass along the Going To The Sun Road in Glacier National Park. 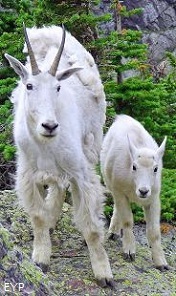 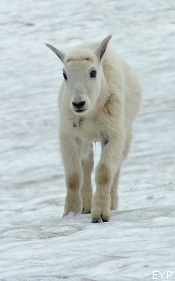 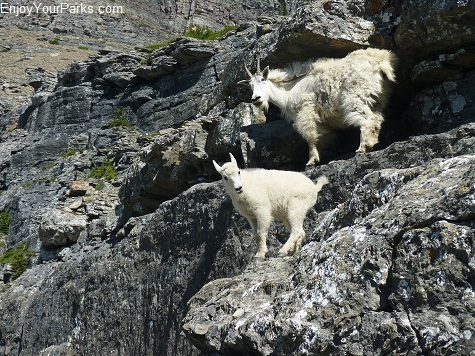 There are plenty of mountain goats on Logan Pass along the Going To The Sun Road in Glacier National Park. 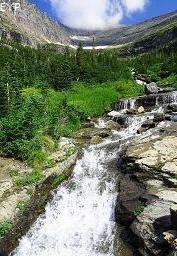 This is a photo of Lunch Creek along the Going To The Sun Road in Glacier National Park. 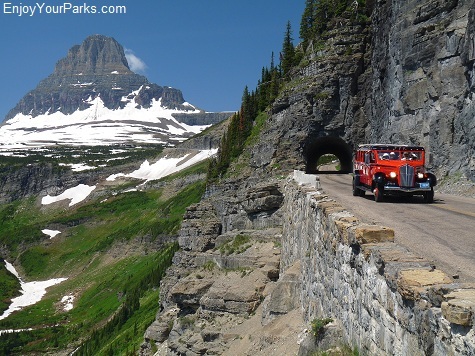 The Going To The Sun Road in Glacier National Park takes you through some of the most scenic landscape on earth. 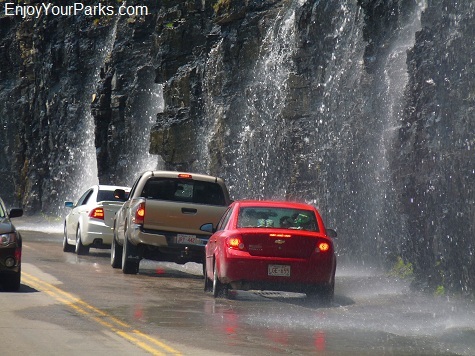 Weeping Wall, Going To The Sun Road, Glacier National Park. 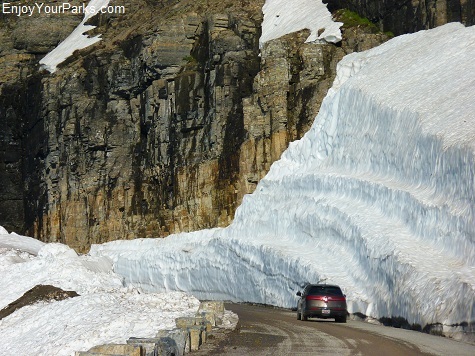 You will definitely encounter plenty of snow early in the season along the Going-to-the-Sun Road in Glacier National Park. 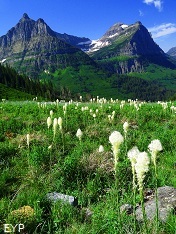 Beargrass along the Going To The Sun Road in Glacier National Park. 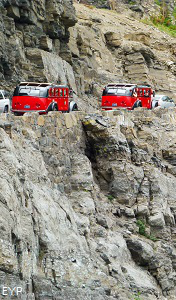 Red buses on Logan Pass is a familiar image in Glacier National Park. 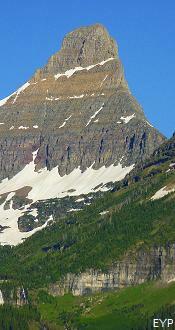 Jackson Glacier as seen from the Jackson Glacier Overlook on the Going To The Sun Road in Glacier National Park. 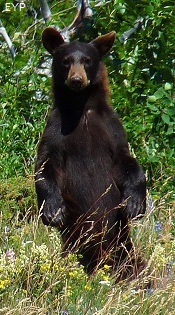 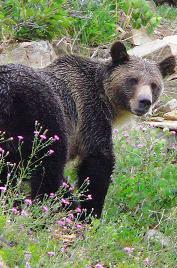 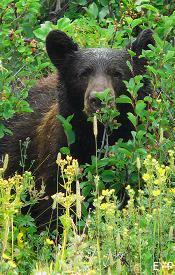 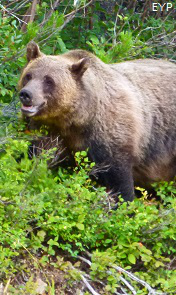 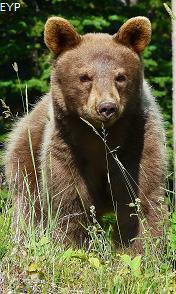 Grizzly Bear near Rising Sun on the Going To The Sun Road in Glacier National Park. 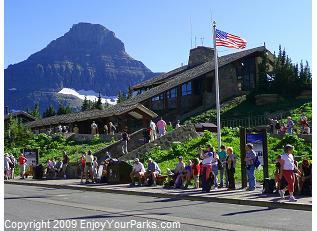 Fusillade Mountain is a prominent landmark along the east side of the Going-to-the-Sun Road in Glacier National Park. 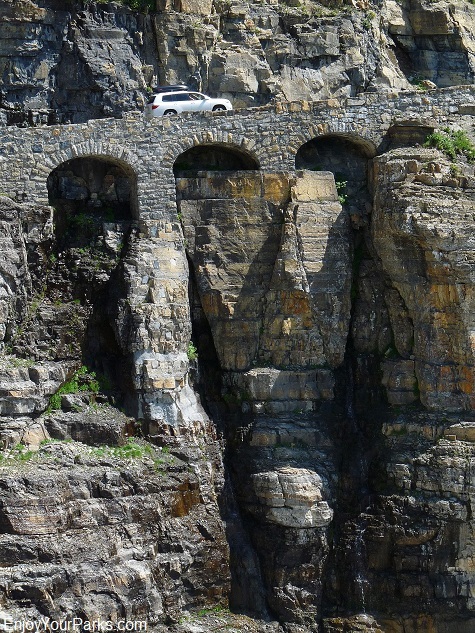 The "Triple Arches" along the Going To The Sun Road, Glacier Park.